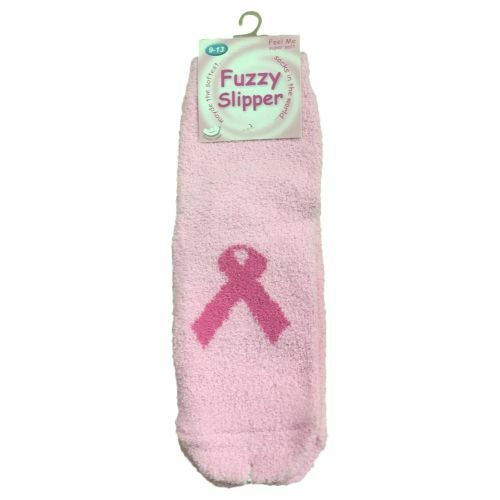 12 Pair Womens Breast Cancer Awareness Slipper Socks at low wholesale prices. Socksinbulk.com offers Breast Cancer Awareness Socks at bulk discounted prices. SPORT SOCKS: Each pack includes 12 pairs of assorted colorful womens socks. Many colors ranging from pink, black, red, and white. Socks include pink ribbon breast cancer awareness print. ATHLETIC SOCKS: Choose from sporty crew socks or low cut ankle socks for that no show look. Comfortable for daily wear. Ideal for activities including basketball, soccer, tennis, running, cycling, softball, baseball and or simply to match with pink outfits! BREAST CANCER AWARENESS: Show your support for breast cancer research. A great value for 12 pack of women's socks. Soft and stylish for the athlete or for casual wearing. Looks great with sneakers, boots, or shoes. PINK SOCKS: One size fits most women. Featuring the pink ribbon iconic symbol. Size 9-11 will fit womens shoe sizes 4-10. CREW OR ANKLE SOCKS: High quality constructoin, made with 97% polyester, 2% spandex, and 1% elastic. Machine wash with similar olors. Use only non-chlorine bleach when needed. Tumble dry medium. Comes in either crew length or ankle / low-cut length for various activities including soccer, softball, tennis, running, or everyday wear. Each pack includes 12 pairs of assorted colorful socks for women. Many assorted colors with pink ribbon print. Get colors including red, black, white, pink, and more! One size fits most women. Socks size 9-11 will fit womens shoe sizes 4-10.